I recently had the opportunity to review Haiti Untold, The Untold Story of Radical Change in Haiti, a moving documentary film about the changes taking place in that country following the devastating earthquake in 2010. I also interviewed co-director Dan Shannon, a committed filmmaker, with over 20 years in the business of film, TV production and distribution. It was a prodigious effort for Shannon and his team. As the world watched, over 200,000 people were affected. As those numbers continued to grow, a group of committed individuals, against overwhelming odds, were determined to provide clean water, shelter, food and the rebuilding necessary to make Haiti safe again. Actor Sean Penn, NHL player Georges Laraque, clothing designer Donna Karan (DKNY), Digicel Founder and CEO, Denis O’Brien, and the president and CEO of World Vision Canada, Dave Toycen, were some of the featured players who have made a difference. This documentary is an attempt to show how their efforts are reshaping Haiti and that all is not lost, even in the wake of the ongoing cholera epidemic. Shannon has secured distribution for hundreds of films and documentaries in the North American DVD market and abroad. Many of those films have been seen in over 120 countries. His consulting firm, ID Communications, regularly works with a range of clients looking for film distribution and marketing support for film, TV and interactive media project launches. It was a pleasure to get his account of the making of this stirring documentary and his detailed recollection of that journey. GALO: What was the genesis of your documentary — what inspired you to begin work on a film dealing with such a devastating subject? Anyhow, when she arrived, it was like Armageddon, bodies everywhere; it was very difficult for her emotionally. In her first few days, I was back in Montreal, feeling helpless and wishing I could help. I was hungry for “on the ground” news, as we all were, and I turned to Twitter, where I realized there was a very close to real-time communications stream of people on the ground trying to communicate with each other by texting their needs via Twitter, and allowing others to see what was going on where. Like someone trapped in a building or a water truck at a certain location. So I became intrigued with the way communication was filtering up to the media, but in this case, also between individuals and actors on the ground. But frankly, I just wanted to help Isabelle with any information I could provide, as it became clear that by geo-filtering the tweets coming out of a certain section of Port au Prince, the main Haitian city, I could tell her about stuff going on near her that she could not see on the ground. In fact, some folks got saved that way, as rescue teams were able to connect with survivors [who were] texting from under [the] rubble. But the film really only began in earnest maybe a month after the earthquake, as I was seeing the media go from very hot and supportive [in terms of] relief messages, to increasingly jaded, focused on alleged corruption and mismanagement of relief resources. Isabelle was dealing with Haiti with a lot of firsthand information of what was getting done, and it seemed that very little of the positive stories made it to mainstream media, but it seemed to me that there was like an unquenchable thirst for negatively-biased reporting on the disaster relief efforts. This was my starting point, as I knew I could not make a film that would be a “scoop” or a highly time-sensitive message. I chose to focus on the positive work that is being done, left largely unreported, and asking the question: why? GALO: Was funding a problem or did you find many within and outside of Canada willing to support the venture? DS: We have an excellent relationship with a TV station in Canada, CTS, who were very supportive, and they provided the seed funding, and we were able to leverage that. Once the film was complete and we presented it at the Cannes Film Market, we were contacted by Brainstorm Media, a US distributor that produces a series with DirectTV called Something to Talk About, where the film is having its US market premiere. GALO: Setting out to do a documentary of this nature might have been considered an intrusion by some. What resistance did you encounter when you arrived to begin filming? DS: Perhaps one of the greatest challenges was how to do what we wanted with our budget. I had to invest my producer and director salaries into the film to get it made for the first two years. It is expensive to film in Haiti, as you need a safe place to store your gear, reliable electricity for charging batteries daily, etc. So, money burns fast while shooting. I am very comfortable roughing it, but you have to balance that out with securing your gear in a country that is dealing with such challenges. Then as the story started unfolding, the role of Sean Penn and his organization JP/HRO became something we wished to deal with in the film. It took a lot of time to make this work, but I am very glad we did as it is an important part of the story. Bill Evans, who runs the golf course in Pétionville where a displaced persons camp of more than 50,000 people were living, was someone I really wanted to get an interview with. At first he did not want to be filmed, but in the end we convinced him, and thankfully he opens the film. GALO: How did you get the cooperation of the principals? Did anyone refuse to be interviewed? DS: When you are a white man walking through the streets in Haiti under such circumstances, with a camera strapped to you, you are not particularly welcome. Haitians are a proud people and do not take kindly to what they perceive rightly or wrongly, [such] as you filming them at a time of distress. We did our best to never film anyone who refused to be filmed, and there were many. 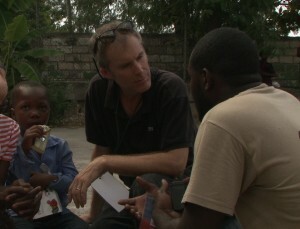 We had a driver, Jean Marc, who ended up being a great character in the film, and he brokered many filming situations for us with the locals, explaining that we were trying to make a positive film about Haiti. This approach warmed many up quite quickly, but I don’t think they would have received that from me, even though I speak French. The other main characters of the film, Donna Karan of DKNY, Denis O’Brien of Digicel, the country cellphone provider, Dave Toycen of World Vision, and Sean Penn and the JP/HRO team, involved more than a year of negotiations and complicated schedule antics to make it happen. In the case of Sean, I think he was quite careful in giving us access, as he has been burned with media not dealing with the Haitian story correctly. In the end, once we started working together, he trusted us a bit more, and we have been very pleased with the support we have had from those in the film. GALO: Did you encounter problems with the Haitian government in place, any censorship issues about what you could say or film? DS: There were no government censorship issues that we encountered. Quite frankly, when seeing the negativity of the press in general terms relative to Haiti, it is hard to imagine we would have anything to say that could be more damaging than that. There was one issue though: the cholera epidemic. It is a documented fact that one of the UN divisions doing humanitarian work in Haiti, unwittingly brought the cholera with them by defecating in rivers, and that sickness spread like wildfire through the country, killing scores of Haitians. As our film unfolded, we came very close to putting that story in. But in the end, Isabelle and I felt that the traditional new media had already told that story as it was very time sensitive, and it would do a disservice to our film’s overall message, namely that a lot of good was getting done in Haiti that is never referenced publicly, and that there is good reason to be hopeful in an emerging Haiti. GALO: Just recently, The New York Times ran an editorial on “Haiti’s Imported Disaster.” They expressed concern that the United Nations refuses to accept blame for their peacekeeper base’s involvement in the cholera epidemic. The numbers are staggering. The newspaper claims that more than 8,300 individuals have been killed and more than 650,000 sickened. The editors expressed the hope that the United Nations if not facing up to its role, will redouble its underfinanced response to this problem. Have you returned to Haiti since the completion of the film, and if so, what was different or what changes did you notice? DS: The last time I was in Haiti was about a year ago. I have many new friends who live and/or work there full-time. In terms of changes, let me just say this: The JP/HRO camp when I was last there had more than 20,000 people still living there, down from over 50,000 at its peak. Now I am told they are under 5,000 and are making great strides in helping those last families find better homes. I call that progress. I actually plan to return next month, and will be looking to see for myself so many changes I am hearing about. I think Haiti is transitioning just now from a country in need to an emerging nation, with a view to economic prosperity the likes of which will surprise us all. They are a very resourceful people and the current, relatively stable political situation goes a long way to helping the country evolve quickly. GALO: Your faith and conviction is inspiring. What are your plans for future subjects? Do you see a follow up to this documentary? DS: We are now just completing a documentary called My Quiet Revolution, dealing with the Quebec question in Canada. The disconnect between French Quebecers and English Canadians has a long backstory, [dating back] all the way to the capitulation of the French to the English a few hundred years ago. It speaks to the geopolitics of Old European ambitions in America and those battles in many ways are still alive today. It will be ready in a month.